Millennials are more likely than other generations to consider themselves handy around the house. Millennials are also more likely to undertake repairs themselves than baby boomers or Gen Xers. Nearly one in five millennials cannot discern a flat-head screwdriver from a Philips-head screwdriver. Millennials are more likely than other generations to describe themselves as handy around the house, although they actually have the least experience at do-it-yourself projects. That’s according to survey results from Porch.com, which assesses the household handiness of baby boomers, Gen Xers, and millennials. More than 69 percent of the latter group describe themselves as handy, compared with about 61 percent of Gen Xers and baby boomers. Male millennials were even more likely to tout their home-maintenance skills, with nearly 79 percent calling themselves handy. Millennials are more likely than older generations to make repairs themselves, cited by 55 percent of respondents in that age group. Millennials are also three times less likely to call a handyman than baby boomers, perhaps deterred by costs. But when it comes to actual hands-on experience, millennials have less experience than older generations in 13 of 21 home-repair tasks that Porch.com tracked. Projects that millennials have more experience in tend to involve technology; 86 percent have set up a Wi-Fi router, and 60 percent have installed a television. Millennials also have less knowledge of common household repair tools than baby boomers of Gen Xers. Nearly 20 percent of millennials did not know the difference between a flat-head screwdriver and a Philips-head screwdriver. They were also less able than older generations to identify Allen wrenches, air compressors, hacksaws, and C-clamps. 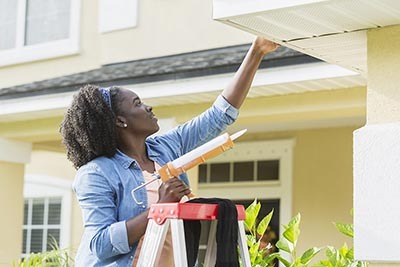 Even if they may not have as much repair and remodeling know-how as older generations, millennial homeowners are pumping a significant amount of money into the home-improvement industry, an average of $26,000 per year.